Antonio Banderas has launched Her Golden Secret, a new fragrance for women. Her Golden Secret is the feminine counterpart to 2011's The Golden Secret and a flanker to 2012's Her Secret. The notes feature bergamot, apple, peach, tangerine, black currant, gardenia, orange blossom, cedarwood, musk, vanilla and tonka bean. 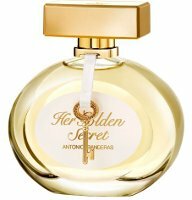 Antonio Banderas Her Golden Secret is available in 50 and 80 ml Eau de Toilette. I think of The Golden Girls, none of whom I see wearing this scent! lol. Just a strange name. I don’t really do apples either. I absolutely love Spirit but really dislike Blue Seduction for women so who knows, guess I’ll just have to try it. Exactly! I LOVE Spirit sadly it has been really had to find it, Blue Seduction was somewhat ok but not crazy about. I’m excited to try this new fragrance.